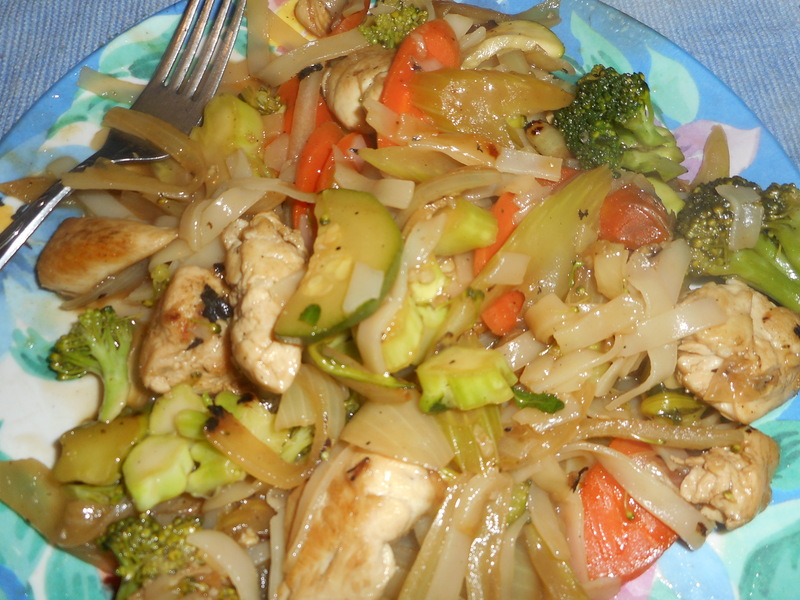 A stir fry is a great way to get veggies into you and your family. We like lots of different vegetables. I put in broccoli for my 3 year old grandson who will eat anything with broccoli in it. Plus carrots for color and sweetness, chunks of chicken breast for a protein source and a few other choice vegetables to round out the mix. This stir fry is made with medium wide rice noodles, the kind you put in Pad Thai. They are low calorie and have no eggs or dairy. The fresh ginger is crazy good for you as is the garlic and all those fresh vegetables. Don’t be afraid to change a vegetable if you don’t like something or don’t have it on hand. My rule of thumb is to try not to have more than five main veggies in it or it will lack a cohesive flavor profile. I used chicken but it works great with thin sliced boneless pork or beef. I actually love it made with light tuna packed in olive oil. Don’t like pineapple juice: use orange juice or another fresh 100 percent real fruit juice. Dislike ginger: leave it out but that will reduce the flavor punch so you might need soy sauce after all. 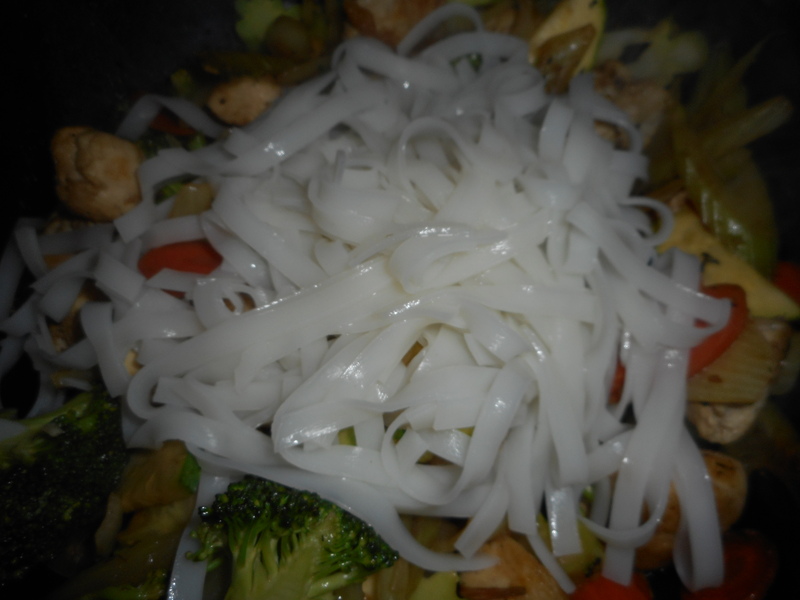 If you hate rice noodles it can be served over brown or white rice. 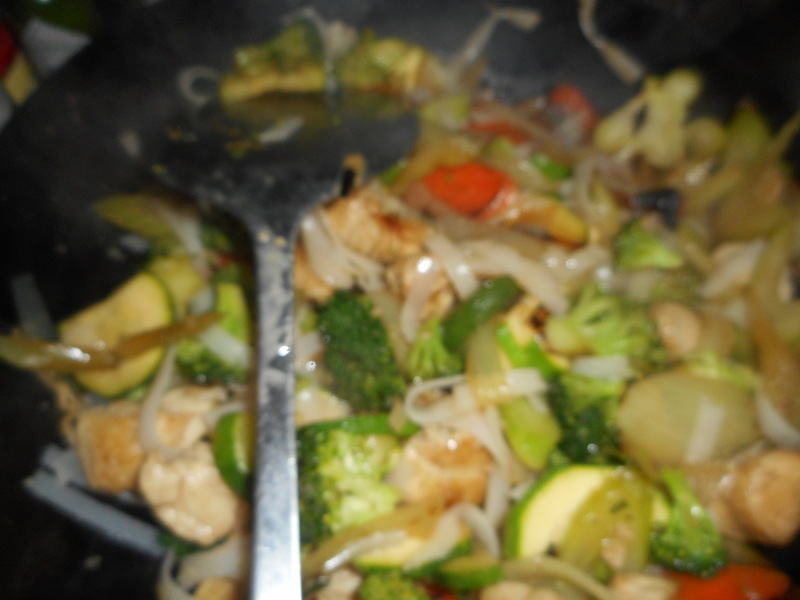 That is the beauty of a stir fry; flexibility in many directions. Don’t be frightened of the rice noodles. They are so simple to make. Just boil up enough water to cover the noodles; pour it over them in a bowl and let stand ten minutes. Drain and they are ready to throw into the stir fry near the end. Simple and they add authenticity without a lot of calories. You can find them nowadays in many grocery stores in the international food section as well as in Chinese grocery stores. This entree goes together very fast once you chop the vegetables. I didn’t add any soy sauce or rice vinegar. I liked the mild clean flavor: lets the ginger and garlic shine. Add those other things if you must! Very important: try not to overcook it – soggy is not the way you want the veggies to look or taste. They should be just barely tender. Makes 3-4 servings depending on your hunger. Prep: Chop onion long way in half and then into long strips. Cut celery into thin slanted slices, same for carrot. Cut zucchini into ¼ inch slices and cut into half moons. Cut broccoli stems into thin rounds and separate the florets into bite sized bits. Peel garlic and smash in press. Put dry noodles into a bowl, cover with the hot water and let stand ten minutes and then drain. Reserve to add near the end of the cooking. 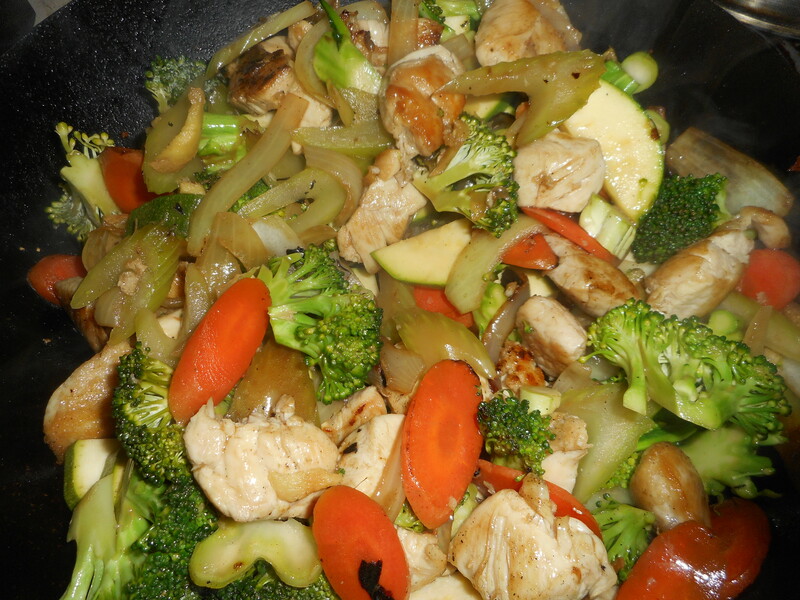 Stir fry directions: Cut chicken into small chunks and season with salt and pepper. Heat a mini wok (9-10 inch diameter) and add half the oil. Heat not quite to smoking hot. Add the chicken; brown lightly on both sides, remove from pan, set aside. Add rest of oil to still hot pan. Add onion and carrot slices, stir for a minute, add celery, stir 2 minutes, add broccoli stems, cook a minute, add the tops, cook a minute, add the zucchini, garlic and ginger. Cook until tender crisp. Add chicken back in. Stir a minute to heat it, add the noodles, stir briefly. Mix the cornstarch and juice; pour over the stir fry. Mix in and cook one minute. If you need more liquid add more juice or some water. Serve hot.